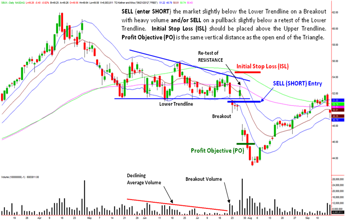 The BEARISH Descending Triangle & How to Profit from it… - Trading Concepts, Inc. The BEARISH Descending Triangle & How to Profit from it… - Trading Concepts, Inc. The BEARISH Descending Triangle... & How to P​ROFIT from it! Good day everyone, yesterday we covered the BULLISH Ascending Triangle CHART Pattern in our first introduction to 11 Powerful CONTINUATION CHART Patterns. A Descending Triangle Pattern is a continuation pattern, usually occurring after a large decline in price. After a brief price consolidation in the “Triangle” with decreasing volume, the trend will usually continue in the same direction as the previous trend. The price target for the subsequent decline in price is approximately the same vertical distance as the open end of the Triangle. Success Rate: 55%, which improves to 96% if you confirm the pattern with a close below the downside Breakout. Duration: Triangles can appear over any timeframe, from intraday patterns to patterns taking several months to form. 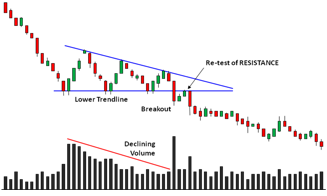 Volume: Decreasing volume through the Triangle, with heavy volume required to break out of the Lower Trendline. Risks: False breakouts are common at the Lower Trendline. Price will break below the Lower Trendline of the Triangle, and usually return back into the Triangle within the day if the breakout is false. Breakouts normally require higher volume, but low-volume breakouts can occur. Trading the Pattern: Keep track of the Lower Trendline of the Triangle pattern. Traders should enter short when the Lower Trendline is pierced on a valid breakout on heavy volume. 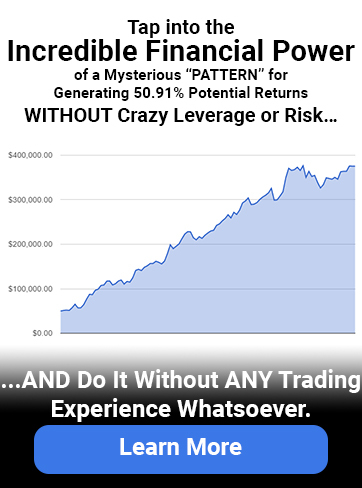 The key to trading this pattern is to avoid the false breakout, which usually occurs due to insufficient volume. It is also common to see a re-test of the former Lower Trendline, now acting as Resistance, after a valid Breakout. Below are a couple real good examples for you to see. Have a great day and be sure to let me know what you think. Check your email tomorrow to learn about the Bullish Descending Triangle and How to Profit From It. Many of the great Titans of Wall Street owe their vast wealth to this phenomenon. Legendary investors like Paul Tudor Jones have used it to amass fortunes of $4.7 billion and more. Now, for the first time ever…you’ll have the power to harness them for yourself. 174.13% in 8 days on Time Warner Cable (TWC). 142.4% in 11 days on NVidia (NVDA). 224.75% in 10 days on Fluor, Inc. (FLR). 203.96% in 16 days on Iron Mountain REIT (IRM). 198.26% in 2 days on Amazon (AMZN). When these ‘High Velocity Alignments’ fire…you have to act fast! Not sure the best way to get started?